Engage your feline's hunting instinct with a toy that adds a touch of nature with Petstages Grass Patch Hunting Cat Box. Made with a unique faux grass on the top, this toy is purr-fect for scratching, hunting and lounging. Plus, the jingle balls on the inside are fun for your kitty to chase and bat. Watch your cat discover more holes on the side for more hunting opportunities, and have fun alongside them as they impress you with their instincts and abilities. Whether you have one cat or many, the Petstages Grass Patch is a toy sure to catch attention! 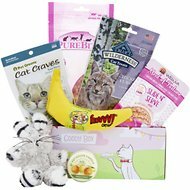 Exciting toy offers cats hours of entertainment while playing into your fur baby's natural instincts. Toy complete with faux grass is purr-fect for scratching, hunting and lounging. Jingle balls on the inside create a blast for your kitty to chase and bat. Discovery sides create even more hunting opportunities for your feline to find. Great for one playful kitty, or homes with multiple cats. My 12 week old kitten plays with this maybe once a day, but never for very long. she does find it entertaining, but gets the balls out easily and they are TINY (like the diameter of a nickel, maybe) and i've already lost one. i tried putting treats in it like a puzzle box, but the side openings were too small and she couldn't get any of the treats out and got frustrated. she may just be not the brightest kitty, so i'd be interested if anyone else has had any luck using it for that purpose. the fake grass is good for sprinkling catnip. I have 5 kittens. It took them less than 5 minutes to remove the balls from inside the toy. Have found 2 still looking for others. Would be better if the balls were larger so they do not come out of the toy and if the grass was more firmly attached. Did amuse them when I would put balls back in but tiring chasing the balls around my frontroom. This toy is perfect for kittens or adult cats. My 8 year old cat who happens to be rather sedentary even was bouncing around getting ball out of grassy patch and chasing it! This is a great hunting toy with cause and reaction, my kitten loves it and it keeps her busy. However, the cat grass edges at the opening holes are sharp and could easily cut your cat’s paws! We removed the grass entirely and use it as a separate play mat. One of the jingle balls came apart, so we replaced all the balls with small foam balls. Play box is sturdy. Our 2 month old kitten loves this toy but it doesn't last. It comes with 3 little balls and she loves to get them out of the grass. The problem is that the sides are made of cardboard so she was able to rip the side apart and now the balls come out of the side. This makes the game much easier and she is eating the cardboard. The balls are also kinda small so she can carry them around in her mouth which makes me nervous. They need to improve this toy by making the sides not cardboard and the toys bigger. We now have to throw the toy away and decided to purchase the peek a prize toy box instead. It seems like the same concept but not cardboard and has bigger toys. Unfortunately he loved it for about a half hour. The balls are too small and he kept grabbing them and taking them out and they'd get lost. After they went under the stove I gave up. If they made the slots smaller so the balls can't come out, I'd recommend it to everyone. But no, don't waste your money. My 4 year old cats LOVE this toy. They play as if they are kittens. Finn likes to get a ball out chase it around swatting at it for a bit then picks it up in his mouth and brings it back to the box. Its so entertaining to watch. My cat that loves it most is 22 pounds. This toy has gotten him to be so active lately. Great purchase! My cats love this toy! My girls love this toy. The only down side is they can get the balls out of the toy. It shouldn't be like that. Now they have lost some of the balls and if they lose the rest the toy is going to be useless.